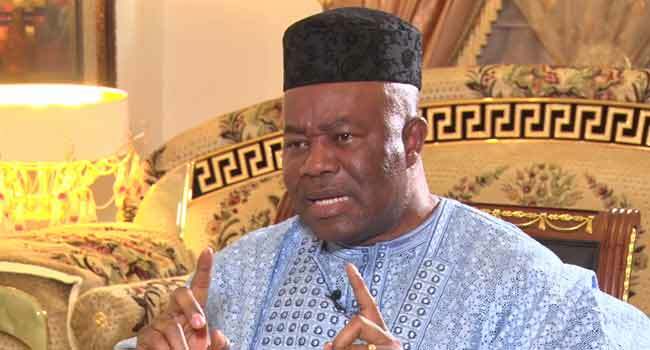 Senator Godswill Akpabio says the recent defections in the All Progressives Congress (APC) was an attempt to frustrate the efforts of the Muhammadu Buhari administration. The lawmaker took a swipe at those who defected from the party during an interview on Channels Television’s Roadmap 2019. “For me, I saw a situation where the ruling party was not only being distracted but the movements were capable of bringing down the government,” he said on the special political programme which aired on Monday. Several top members of the APC, including Senate President Bukola Saraki and the governors Benue, Kwara, and Sokoto defected from the party recently. All of them accused the APC of failing to keep its promises to the nation and attributed their defection to national interest. But Akpabio faulted their motives, insisting they had nothing to do with national interest. The former Senate Minority leader who had recently defected from the Peoples Democratic Party (PDP) to the APC recently himself, however, attributed his own decision to the national interest. Ahead of the 2019 elections, Senator Akpabio urged leaders in the country to shift their attention from political interest and work for the good of the people. He also advised the critics of President Buhari’s administration to support the government to tackle insecurity and other challenges of the nation rather than coming together to take over power at the centre.